On Friday 21st April we boarded the coach outside St George’s at 7.30am, picked up our fellow pilgrims at Rowlands Castle and then set off to Walsingham. We had a very welcome coffee break at a motorway service area and stopped at Newmarket for lunch. Lots of us headed to Wetherspoons - some for a snack, others to take advantage of their “Fish Friday” club. I couldn’t resist popping into Edinburgh Woollen Mill afterwards as last year, and found a jumper I just had to buy! There were no traffic holdups on the way and we arrived at the Shrine in good time. After our First Visit to the Holy House we settled into our rooms or went for a coffee in the Norton Room Cafe. The weekend flew by as it always does. After Stations of the Cross on Saturday morning we walked, or took the coach, to the Catholic Shrine. After lunch we had free time to explore the village, catch the light railway train to Wells and back or just chill out in the Shrine gardens. John and I looked around the museum at the Tourist Information Centre and then, as it was a nice sunny afternoon, walked in the Abbey grounds. The weather stayed fine for the two outdoor processions, we had Eucharist services in the Barn Chapel and the Shrine Church and were duly ‘sprinkled’ at the well. All too soon it was time to say goodbye, re-board our coach, and head for home. 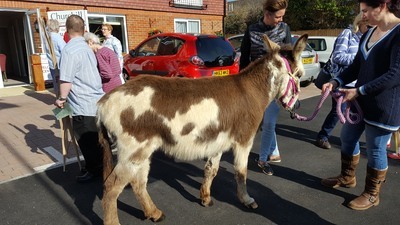 Our Walsingham Pilgrimage is always hectic, spiritual and a very special weekend. 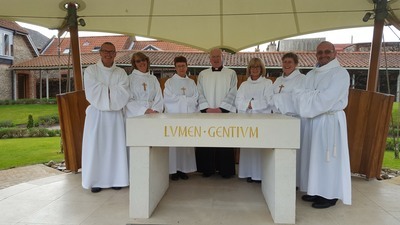 This pilgrimage was extra special as it was the last one where Fr Mike and Lynda will be with us. On Mothering Sunday the children gave each lady in the congregation a small bunch of daffodils - then as there were some over the men got flowers too! Mothering Sunday, also known as the 4th Sunday in Lent, Laetare Sunday or Refreshment Sunday, is the mid point of Lent. People were allowed to relax their Lenten Fast today and young girls who were in service took simnel cakes home to their family. Lent this year was a busy time - it always is! New for this year we had Lent Lunches of soup and bread and cheese held in aid of Christian Aid, and £330 was raised for the charity. During Lent we had Stations of the Cross at different times each week to suit everybody and special Sunday evening services including Evening Devotions, Sung Evensong, a Taizé Style Worship and a Eucharist with the Gifts of Healing. Our Open Sermons following the 10am Sunday services proved to be very popular and not many parishioners escaped through the Church doors before they began! Their subjects: “Are the Sacraments still needed?” “Is the Bible still relevant today?” “Are we living in God’s Kingdom?” and “Why is Holy Week so important?” were thought provoking and produced some lively discussions. Arriving eventually at St George’s with a blessing of the new notice board and defibrillator, we then rejoined the rest of our congregation in church to complete the service. On Saturday 29th April several members of St George’s Social Committee were busy in their kitchens making cottage pie for eight’s - following a recipe provided by Rosemary - so that every pie would look (and taste) the same! In the afternoon tables were laid and everything prepared ready for the Parish Lunch which was to follow the APCM the next morning. On Sunday pies were heated, veg cooked, gravy made and a selection of cheesecakes sliced and plated. After the serious business of reading reports and electing Churchwardens and PCC Members a Parish Photograph was taken - not an easy task with so many of us crowded onto the altar steps. Then it was into the hall for a sherry and lunch. A starter of paté preceded the main course and there was red or white wine with our meal and coffee and mints after. To finish we had Evensong, which was held in the hall - for some reason Fr Mike has found this to be better than moving into the Church - did he think some of his congregation might get lost on the way! 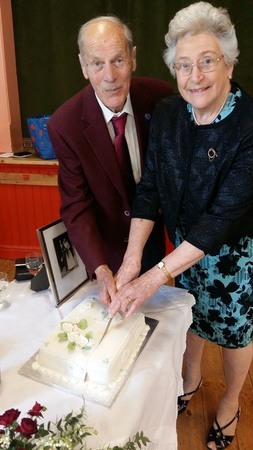 John and Margaret Symonds celebrated their 60th Wedding Anniversary with the cutting of a cake at the Church Hall on Sunday 23rd April. In Holy Week there were services each evening. On Maundy Thursday was the traditional Washing of the Feet (or rather one foot each volunteer!) Afterwards a vigil ending at midnight with Compline. 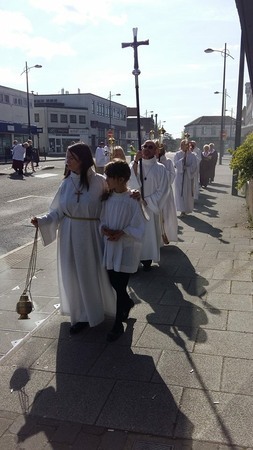 There were three services on Good Friday - at the Foot of the Cross at 10am, an Ecumenical Procession from the Baptist Church via the Roman Catholic Church, stopping again in the midst of the Friday Market in Waterlooville Precinct, then to St George’s where hot drinks and hot cross buns awaited us. The Solemn Good Friday Liturgy including the Veneration of the Cross was again followed by hot cross buns in the hall. We celebrated Holy Saturday with a Passover Seder Meal. This ancient tradition recalling the flight of the Hebrews from Egypt was the Last Supper that Jesus ate with his disciples and the basis of what is now the Holy Eucharist. It is part ceremony, part explanation, part meal. Afterwards the New Fire of Easter was lit and from this the Paschal Candle for the coming year. We finished on Easter Sunday with a Festival Evensong and Devotions which I always think is a lovely way to end the Easter Celebrations. 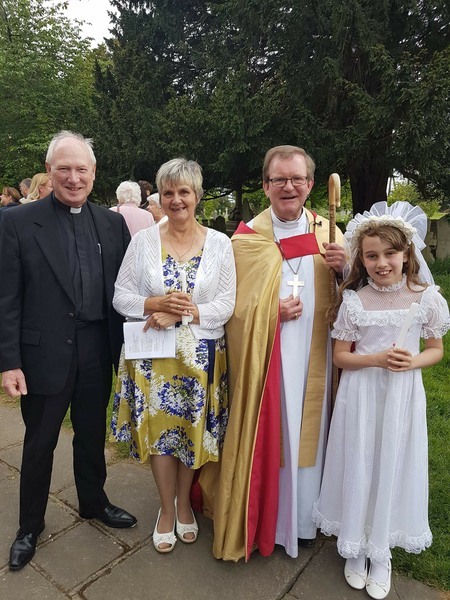 Marilyn Atkins and Amber Gadd, with Bishop Christopher and Fr Mike on the occasion of their Confirmation on 6th May at St Mary’s Church, Hayling Island. 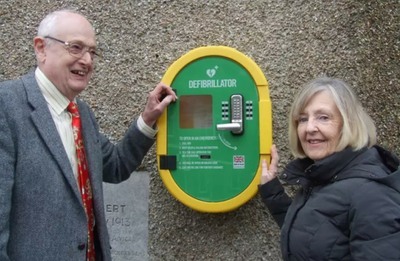 Churchwarden John Hood with County Councillor Anne Briggs marking the installation of the new Defibrillator at the Church Hall. The machine was provided thanks to a grant from Hampshire County Council and support from other donors including Waterlooville Music Festival. Jackson’s Electrical generously undertook the electrical work free of charge. 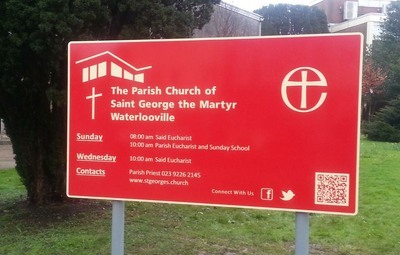 The new Sign Board at the church has been installed. With thanks to Northwood Estate Agents for their generous contribution towards the cost.